Procrastination is not something most of us strive for when trying to accomplish goals or daily tasks, yet most of us have been guilty of it at some time or another. In my life, it seems to be a recurring theme. Over the past few years, I have found that procrastination was a luxury I could not afford. With taking care of three ill parents, death of two parents and father-in-law, finishing college, helping my husband in his business, re-inventing my old business, tons of my own medical problems, a daughter getting married, and starting the blog, my life has been busy, to say the least. As if this is not enough, my husband works away from home most of the time, so I’m left with all the household chores, paying bills, handling of our personal business, and anything else that comes up. In trying to reduce stress and enjoy life more, I obviously need to be able to accomplish certain tasks in a timelier manner, so I am not left with feelings of guilt and defeat, or don’t become overwhelmed. I still struggle with procrastination on a daily basis. Knowing there are many people like me, I decided to share with you some of the ways I’m learning to procrastinate less, and accomplish more. Be honest about what is causing you to procrastinate. The reason may be fatigue, anxiety, fear, dislike of the task at hand, inability to do the task, or any other of a number of reasons. Once you figure out the reason you are procrastinating, you have to deal with that reason and then make the task a priority. Break large tasks into smaller ones, so you don’t feel so overwhelmed. 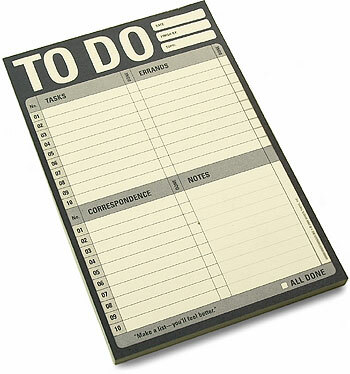 Keep a written to-do list that consists of daily tasks, weekly tasks, and long-term tasks. For the daily, this might be things like house cleaning chores. For weekly tasks, this might be things you hope to accomplish during the week, but not sure which day you will do it. This could be something like making a phone call to schedule a yearly physical (one on my list that I have put off for a while because I just don’t like going). For long-term tasks, this could be something like getting things together to take to Goodwill. Keep your to-do list with you at all times, so that you can add to the list at any time. You can also use this list as a reminder to keep you focused, when you have some spare time, like waiting at a doctor’s office. Always try to accomplish the hardest tasks, first. This way, you will have a sense of relief and feel more confident going forward with the remainder of the to-do list. I like to assign numbers to my to-do lists, to help me stay on track. Try to avoid distractions when working on your tasks. For example, I almost always move much slower if my TV is on. When I turn it off, I get things accomplished much faster. If you receive an unimportant phone call while in the middle of completing a task, ask the person if you can call them back later. You don’t have to explain why, accept that you are busy. If it is important they will let you know. If not, they usually won’t mind waiting for you to call them later. Try to complete one task, before starting another. If you are in the middle of paying bills, then don’t stop to fold a basket of laundry. If you are folding laundry, don’t stop half way through to make a phone call. Speaking of laundry, when you fold it, try to follow through then with putting all the clothes away. It’s not a chore anyone likes to do, but leaving it for later only causes more clutter and stress. Find ways to reward yourself for completing large tasks or many smaller ones. It is okay to carve out some time for yourself to relax. Just be realistic about the time you take to relax. Don’t plan on taking an hour break, and then 3 hours later you are still doing nothing. I like to relax at the end of a busy day. This is my way of unwinding before bedtime and rewarding my self for all my accomplishments that day. In the past I would work hard right up until bedtime because I felt there was still so much left undone. However, I am now finding that the work will still be there the next day, and it’s important for my health to have some relaxation time, as well. This one is still a huge struggle for me, because I am a workaholic once I get started on something. When prioritizing your to-do list, be realistic about how much you can get done in a day. Don’t try to be a super human. Having too many things on your to-do list will usually leave you with part of your list unfinished. Also, don’t beat yourself up if you don’t finish the list. Just make those items a priority for the next days’ list. Before quitting for the day, make sure you have your list ready for the next day, so that you wake up knowing what you will start on, first. It will help you stay focused. I hope these tips on overcoming procrastination help you. Have I overcome procrastination? Of course, not – I am a work in progress! Please let me know any tips you have for overcoming procrastination or comment on any of the tips you’ve read here. We love to hear from our readers. Now go make that to-do list and get started! You can do it!